Redmi Y1 and Y1 Lite bring Xiaomi into the selfie game, but Y? Xiaomi announced a new India-exclusive selfie focused smartphone series with the Redmi Y1 and Redmi Y1 Lite. This adds to the already existing Redmi lineup of affordable smartphones including the Redmi Note 4, Redmi 4A and the Redmi 4. These phones are aimed to offer a value for money package with minimal compromises on the hardware, battery and design, which certainly is the reason behind the success of these phones. On the other hand, the new Redmi Y1 adds another element that’s been the focus of many phone makers -- A powerful front camera sensor. Redmi Y1 comes in two variants— 3GB RAM/32GB storage and 4GB RAM/64GB storage. The 3GB variant is priced at Rs 8,999 and the 4GB variant comes for Rs 10,999. The low-end Y1 Lite has just one variant that comes with 2GB RAM and 16GB storage at Rs 6,999. To make sure that the Redmi Y1 doesn’t lack basic processing power over the camera, the company has included similar internals as the Redmi 4. It is powered by an entry-level Snapdragon 435 processor with 3GB/4GB RAM to aid multitasking. Both the variants come with dual-SIM support with a dedicated microSD card slot with up to 128GB expandable storage. The display measures 5.5-inch, has HD resolution (720p) and is protected by Corning Gorilla Glass. The latest MIUI 9 on the phone runs on top of Android Nougat. The key highlight of the phone is its 16-megapixel front camera with LED selfie light, and an improved 13-megapixel rear camera with PDAF. It measures 153 x 76.2 x 7.7mm and weighs 153 grams. It will be available in Gold and Dark Grey colours. The Redmi Y1 Lite is a more affordable variant which sports a 5-megapixel front sensor in place of a 16-megapixel sensor and a Snapdragon 425 processor with 2GB RAM and 16GB storage. Apart from this, rest of the specifications are same as on the Y1. Redmi phones undoubtedly offer a great value for money but the camera on these phones were never the talking point till now. Xiaomi usually went with the basic 5+13-megapixel camera setup on Redmi phones but this one looks like a special case where users can get a good selfie camera on a budget device. 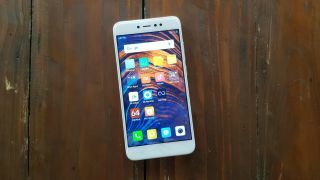 Similarly, The Y1 Lite variant is aimed at users who are satisfied with a phone like Redmi 4A but require a bigger and better display under a budget. For those who are questioning Xiaomi about rebranding Redmi Note 5A Prime and Redmi Note 5A in India are in fact the same people who complain Xiaomi doesn't bring all their products to India. After all, what's in the name? I would say, why not? Looking back at 2015-2016, the loudest questions that Mi fans asked was ‘why XYZ phones from Xiaomi do not make it to India?’. Here’s the answer. Starting 2017, Xiaomi has heavily focused on Indian market which is undoubtedly giving returns to the company and that’s good for both. The launch of Mi Home, Mi Mix 2, Mi Router 3C and more such products are enough to have an idea of the approach Xiaomi is coming up with. Irrespective of how much the brand is making from the country, it is good to see that it understands how important India is for Xiaomi. In my opinion, it’s always better to have more options when you are a known brand under a certain price category. I also agree that Xiaomi already has some really good phones under the price range it chose for the Y-series phones, but how can we ignore variety? Many are saying that this was not required but why not? It’s not that Xiaomi is discontinuing the Redmi 4 or the 4A, they are simply providing more choice to customers. Obsession of selfies is a real thing and so is the need for keeping the budget under constraint. If the question is about the quality of selfies, or hardware, at Rs 8,999 Xiaomi is giving a good hardware, and being one of the early testers of the phone, I can say the quality of selfies is also worth the price. The Redmi Y1 is the first selfie-centric phone from Xiaomi, and also the first to ship with MIUI 9 in India. Also, let’s not ignore that Xiaomi has also roped in Bollywood actress Katrina Kaif to endorse Y-series smartphone. Well, it’s been a trend to indulge known faces from Bollywood to promote selfie phone. That’s been a standard among brands like Oppo wh Deepika or Vivo getting Ranveer Singh to do the job. Still, we cannot ignore the fact that the Y1 still justifies it’s price unlike phones from aforementioned brands. Since Xiaomi is slowly moving in the same direction in terms of marketing, we just hope Xiaomi doesn’t bombard advertisements in our head which is also a norm these days with major Chinese smartphone brands in the offline market. How and when can you buy the Redmi Y1 and Redmi Y1 Lite ? Both handsets will be available via Amazon India, and will go on sale via Amazon and Mi.com on November 8. After that, the handsets will be available via Xiaomi’s offline partners including Reliance Digital, which is the newest in the lot.